Hey all, Terminal Lance Rob Bates here. Anyone who’s ever been to Afghanistan and had the opportunity to work side by side with Afghan interpreters should know how important Thursday is to some of them. I can’t speak on behalf of those who’ve served in Iraq, because I’ve never been there—but I can safely assume that if you’ve served in a line company, or in direct support of one in Afghanistan, you probably have your own Man Love Thursday stories to share. This strip is loosely based on a true story. About 11 years ago while deployed with BLT 1/6 near Tarin Kowt, I remember waking up only to see from 10 feet away one terp resting his head on the bare chest of another terp. Both were lying in that pose while talking to a third terp who was standing in front of them. I can’t remember whether or not if this fell on a Thursday but, regardless of the day of the week, it was a pretty disturbing sight to wake up to. 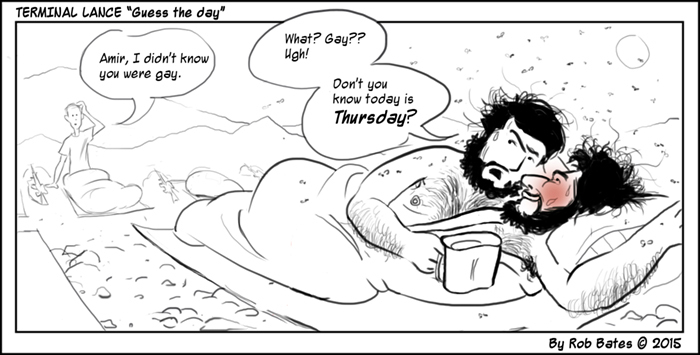 I can’t say for sure who coined the name Man-Love Thursday, or how it all got started. What I can say, though, is that it’s a very real thing in that area of the world and in various parts of West Virginia. Before I go, I would also like to share with you the art that I make. In addition to being a former 0311 Terminal Lance with two hashmarks, I’m also a freelance combat artist and a professional editorial illustrator. Follow me on my Facebook page, where I post regular unscheduled updates about the work that I make. Lastly, a here’s big thanks to Max for asking me to make today’s strip and for the plug-in.